Thousands of schools were closed as members of the two biggest teaching unions took strike action in a row over pay, pensions and workloads. The walkout affected schools in 49 authorities in the east of England, the Midlands, Yorkshire and the Humber. The government said the strike would disrupt learning, inconvenience parents and damage the reputation of teachers. At least 2,500 schools were closed or partially closed. The strikers are angry about changes to their pensions, increased workloads and government plans to bring in performance-related pay. NUT general secretary Christine Blower said teachers could not "stand by and watch our profession be systematically attacked and undermined". She declared the action a "huge success" and added: "There can be no doubt left about the feeling of anger towards this government's treatment of the teaching profession. "Strike action is never a step that teachers take lightly and we are very aware and concerned about the inconvenience it causes parents. "Unfortunately we are faced with a coalition government that is refusing to listen to the reasonable demands of the profession." Teachers gathered for a series of marches and rallies in support of the strike. "These are relentless attacks from this government, not just on our pay and conditions but on the education system in general. Media captionMichael Gove: "There is nothing 'child-friendly' about industrial action"
BBC News Online journalist Max Mulgrew said he had seen about 3,000 people in Birmingham's Victoria Square. "I've seen banners from NUT and NASUWT groups from Dudley, Coventry, Warwickshire, Walsall, the West Midlands region and even Wigan," he said. About 2,000 people had gathered in Barkers Pool, Sheffield, and about 800 assembled at Parker's Piece, Cambridge. 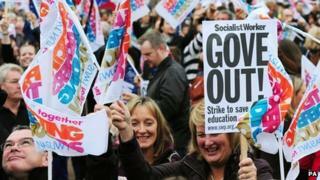 Alison Core, a Shropshire primary school teacher, said: "Teachers do not want to strike but we feel we have no choice. "Our jobs should not be about pay and targets. The bigger picture is the education of the children and with so many fast changes in the industry, we cannot lose sight of that." Jane Lucas, a parent from Coventry, said one of her children was at home and one was at school. She said: "Luckily, there's a couple of mums that we've managed to rally round and we're going to share the childcare today. The confrontation isn't just about changes to teachers' pay, such as introducing more performance-based reward. It's about a different worldview of education from the government. Such ideological disparity makes it harder for the two sides to reach an amicable accord. Parents and children will be caught in the middle until teachers and politicians can find agreement and reconciliation. But with the rolling regional strikes due to reach London and the south-east later this month, and the threat of a national strike before Christmas, it will take a great deal of movement to resolve the dispute this term. "It's difficult because I do support any worker who wants to fight for the right of their pensions and pay, it's just unfortunate that it's affecting children." Lisa Chambers, Conservative deputy leader of Suffolk County Council and cabinet member for education, said she had taken her son Alex, 13, with her to County Hall meetings. "Unfortunately we don't have grandparents close to us and friends have got to make arrangements for their own children so he's had to come to work with me," she said. "I have a diary of commitments to people and I really don't feel I can let people down because of this strike." Chris Keates, general secretary of the NASUWT, said: "Strike action is a last resort, teachers have been left with no choice but to demonstrate their anger and frustration in the face of their genuine concerns being dismissed and trivialised. "Teachers of course deeply regret any disruption to children and families. "Such action would have been unnecessary had the secretary of state been prepared to engage in genuine discussions." Teachers strike: The 'only option'? "Industrial action will disrupt pupils' education, hugely inconvenience parents and damage the profession's reputation in the eyes of the public at a time when our reforms are driving up standards across the country. "In a recent poll, 61% of respondents supported linking teachers' pay to performance and 70% either opposed the strikes or believed that teachers should not be allowed to strike at all."